No matter the weight or size Brockton tree Co. is ready to grind out your unsightly or unwanted stump. With a passion for serving the New England area in well-rounded tree services, stump removal is only one aspect. But, this is the service that people often try to do on their own first. Then eventually they call a professional service. Expensive at-home chemical treatments and machine rentals are common throughout the New England area. But, even with chemicals and machinery stump removal is physically demanding. Save yourself the back pain, and money spent on chemical stump killer by calling in a professional tree service first. We have the equipment necessary to get the job done right the first time. It also means you won’t have chemicals tread throughout your yard in an attempt to fight out a stubborn stump. 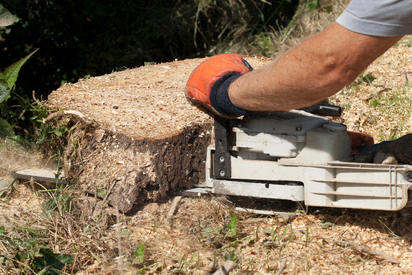 ​Stump grinding and removal is one of our specialties, so give us a call to get the cost of stump removal today. Why Call For Stump Removal? Although many argue that stump removal is completely aesthetic there are health issues and potential property damage that comes with leaving stumps. Tree stumps throughout your property can lead to termite infestation, tripping, and are a hazard to kids playing in your yard as well. How? They are a constant trip hazard, and that neighbor who cuts through your yard could be a liability when he falls in your yard. As stumps are often ground very low to the ground they usually aren’t seen until it’s too late. Especially throughout the New England area where there are possible soil shifts and snowfalls that often mask rather tall tree stumps. Stumps could also spawn new sprouts. Small trees can begin growing around the stump and create their own root systems. This can disrupt the soil and pose further trip hazards. On top of building their own root systems, they begin draining nutrients from nearby plant life. To top it off, stumps are the perfect home for insects and other unwanted guests. Termites enjoy a good chunk of unattended wood, and it might seem like a stump is the perfect place for them. However, they can eventually spread to your home. Ants, beetles and many other insects also enjoy moving from barren tree-stump to warm home. All of these issues can be solved by having your stump removed completely. The process takes a day or two without chemical treatment. No chemicals in your yard, no trip hazards, and no bugs! Brockton Tree Co doesn’t leave the unsafe conditions that people are often concerned about after stump removal. Any holes created by stump removal can be filled easily and completely.